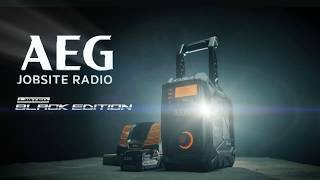 The limited black edition of the AEG 18V Bluetooth Jobsite Radio Kit w/ 4.0Ah Battery & Charger plays your favourite music, talkback, podcasts and more while you’re at work. The battery, charger and AC adaptor ensure you can have tunes in the background throughout the working day. And the sound quality is great – the two premium 10W 3.5” speakers deliver deep base and crisp mid-range acoustics. This compact worksite radio gives you plenty of audio choices. Bluetooth 5.0 technology provides a fast connection up to 40m (outside). The AM/FM radio includes 5 pre-sets for quick channel selection, so you won’t lose any time searching for your favourite channel. The AUX cable and device storage includes a protected compartment, so you can keep your smartphone or other device safe while it’s connected. The jobsite radio is made with IP64-rated reinforced housing, and the durable ABS outer shell is tough enough to withstand impacts and wet conditions. The handle and compact box design make it easy to transport and store. It even has a bottle opener attached – great for knock-off beers. In addition to the 4.0Ah battery and 18V fast charger included in this kit, the radio has an AC power adaptor – so the music can keep playing while the battery is powering back up. On-board USB charging means you can also recharge your devices. Add some tunes to your worksite with the AEG 18V Bluetooth Jobsite Radio Kit w/ 4.0Ah Battery & Charger. It’s available exclusively at Bunnings Warehouse.